Quite a few people have recently let me know that they see my unfocused photographs as my signature shots. The blurred, bokeh-heavy images that I occasionally share on my Instagram have unintentionally become my trademark style. As I’ve also received several questions asking how I take these photos, I thought I’d share a few tips as well as explaining why I love to shoot out of focus. I think my love affair with out of focus images began this time last year, when I was taking Sara Tasker’s Gloom & Glow e-course. As I worked through Sara’s modules, I found myself thinking about my particular style of photography. I wanted to hone in on a recognisable style and come up with an aesthetic that would remain consistent across all of my images. The words that I chose to represent my aesthetic were light, slow and focus. I talked about the reasons why I selected these words in a blog post at the beginning of this year, but I have considered these words carefully when working towards refining my style. 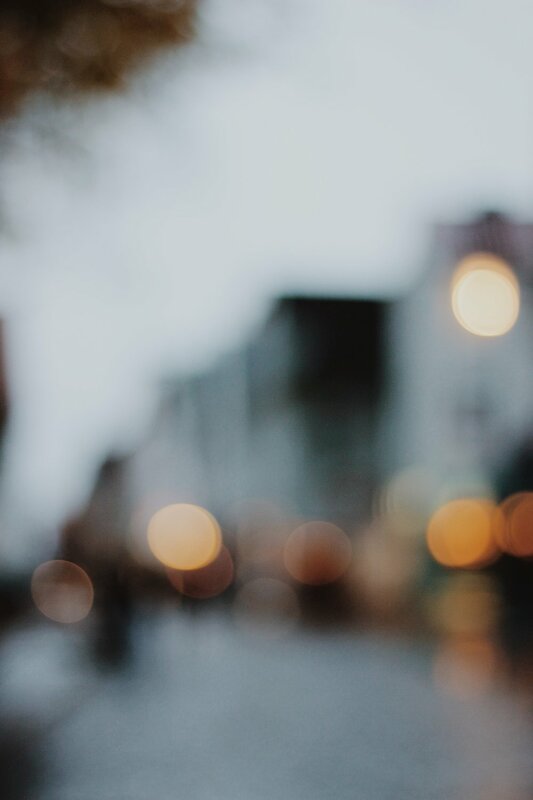 Having always loved playing around with focusing, I wanted to show the glow amidst the gloom – the light that is always there, even on the grimmest days. I did this by experimenting with intentionally blurring my images until any lights showed as bokeh on my screen. There were two ways that I tried to do this. The first was making an image that was completely out of focus, but choosing a scene that would still be recognisable – such as a city street or a Christmas tree. The second way was to focus on something small (a tree branch, a flower petal, a snow flake) but to allow the majority of my image to be out of focus. With both types of image, there had to be several light sources to achieve the bokeh effect. I found that fairy lights or just light shining through the branches in a tree worked perfectly. In spring and summer, I found that this technique worked just as well with nature photography, particularly flowers. I spent months photographing the different flowers that I stumbled up, purposely blurring most of or all of the image. 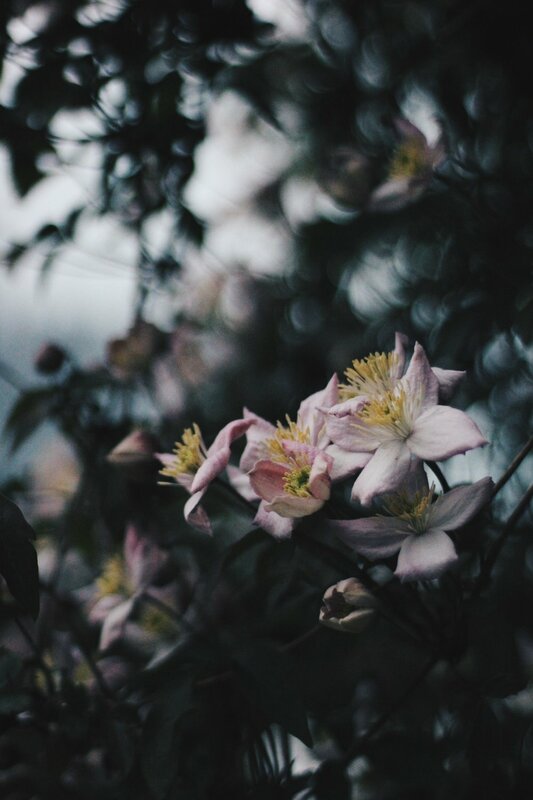 When I started to sell prints of my images, I was shocked that a completely defocused photograph of the clematis plant in my boyfriend’s parent’s garden was the most popular image. Playing around with focus can make even the simplest image more interesting. I love using my 50mm lens on the maximum f1.8 aperture, as it creates so much more depth in an image. Rather than just a flat portrait where everything is in focus, I like to create a soft blur in the background. One of my favourite portraits of the past year (a collaboration with my boyfriend, who took the photo for me) was a simple shot of my arm outstretched holding a fern in front of my face. My hand and the fern are in sharp focus, the rest of my body is soft and out of focus, while the background has a pleasing bokeh effect. So, how can you replicate these images and take your own photos with intentional blur? The most important consideration is your lens. You need to be able to shoot on at least f2.0 to get the maximum bokeh. You then need to set your camera to manual settings and manual focus, expose the image how you would like it to appear (I usually under expose to accentuate the darkness) and turn your lens to set the shot out of focus. I find that it helps to look at the image on my camera screen, to know when I’ve achieved the level of bokeh that I’m after. You may want to take a series of snaps, as you further defocus your image, so that you have several to choose from. I’ve found that the more simple the scene that you are photographing, the more out of focus you can go. See below - the snowy scene of the town is only slightly out of focus; any more and you wouldn’t be able to tell what the image was. The Christmas tree image, on the other hand, is such a recognisable silhouette that I could get away with more bokeh. To achieve this out-of-focus look with bokeh (“the way the lens renders out-of-focus points of light”), you need to have a light source. This could be the flicker of the flames of a group of tea lights or a string of fairy lights, but natural light works too. When I’m trying to capture bokeh outdoors, during the day, I look for where the light is. My favourite trick is to capture the light shining through the branches of trees, focusing on something close to the camera, angling the camera so that I capture that background blur of light. I’d love to answer any questions you have on my photography, and have a few more posts lined up where I’ll be talking about how I got into photography and how I try to capture emotion through my imagery. If you’re looking for more photography advice, I’d recommend checking out my friends Jo & James Melia. They offer everything from e-books to e-courses and mentoring packages.